Here at Anthony Formal Wear, When it comes to your wedding outfit nothing says one of a kind more then a personalised embroidery. Whether it is inside of your jacket or on the cuff of your shirt, there are many ways in which you can give your suit that extra edge. In fact why not even have it in your shoes…..
Not only do you have a choice with the words you pick, but you can also choose the font you want it in and even have the embroidery done in a colour to match with the bridesmaids. Thankfully we have a wide selection of colours available to choose from which can help link the wedding colour scheme into the outfit in a subtle way. 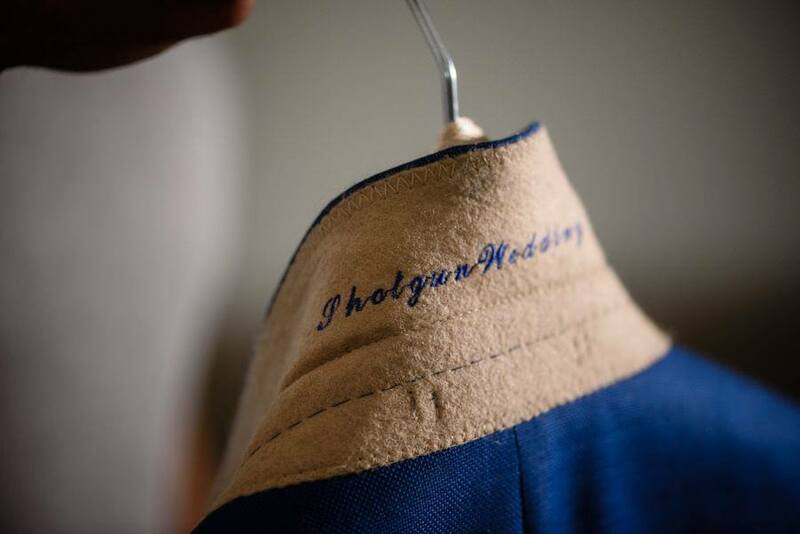 With your jacket embroidery you have two options; the first is on the inside of your jacket on the lining. The second is underneath your collar. 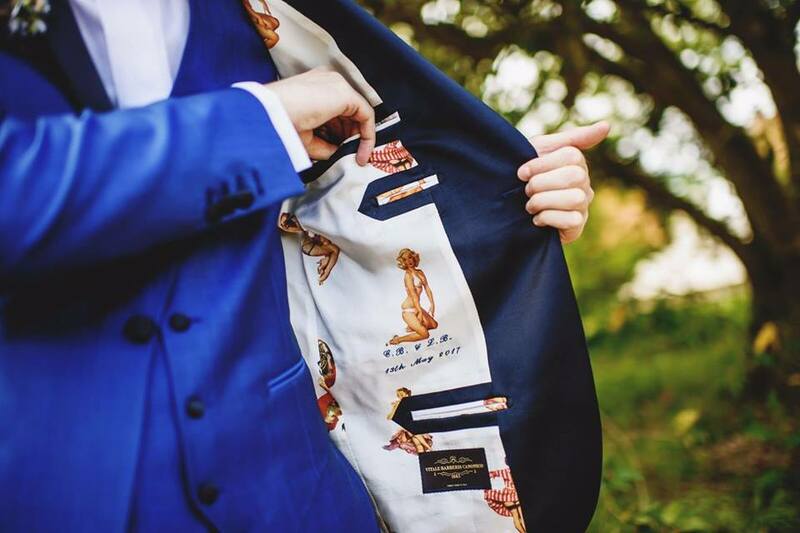 With many of our customers here at Anthony Formal Wear, the inside of the jacket will usually have a patterned lining, including anything from classic pin up girls to old fashioned bicycles! But the extra touch of personalisation comes in the form of either one or two lines of embroidery. 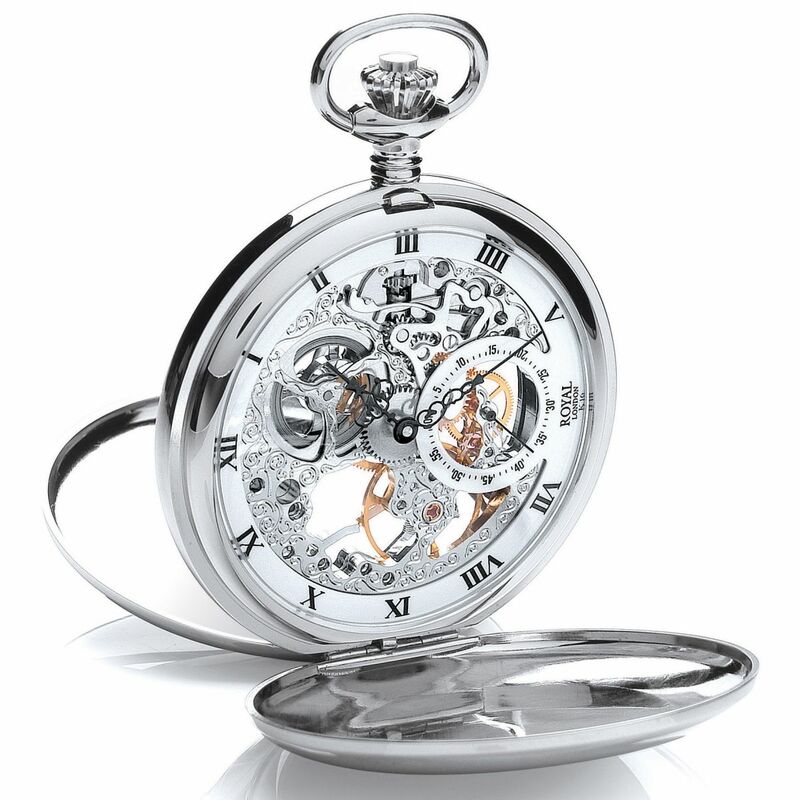 The top line, more often then not, will include a couples initials with the second line consisting of the wedding date. A classy touch from a groom’s point of view to make sure he will always remember his special day. Some times though, we get customers who come in and want to go one step further with there embroidery. Something that goes against the norm. Something that means something to them personally. The originality in some of these has ranged from favourite quotes and lines taken from some of the most iconic music in our history. These unique people make us enjoy what we do, and give us more inspiration for our other customers in helping them personalise there wedding suit. Now with the embroidery underneath the jacket collar, we see people start to get a bit braver with what they have put underneath. Because the jacket collar cannot be seen unless lifted, many of our groom’s feel this gives them a bit more freedom with what they can have. Many still keep it nice and tasteful by having a few nice words put in, but others like to push the boundaries of what they can get away with. Some even going as far as explicit content, the likes of which are to strong to be seen on here. Our most common embroidery tends to be “Just Married” as a classy touch to the groom’s wedding suit. The braver guys go a little bit further with this embroidery, and see how much they can get away with. Many of these will be their favourite football teams in the teams colours, or private jokes between friends. Either way it makes for a great picture when he makes the grand reveal of what he has chosen to go under his collar. But if that is what the groom wants in his wedding suit, then who are we to say no? And of course the bride will take it all as a joke…..won’t she? A bit of fun can go either way, but the bride was amused on this occassion. The embroidery on the shirt can come in a variety of places, on the cuff, under the collar, or even just on the front of the shirt! 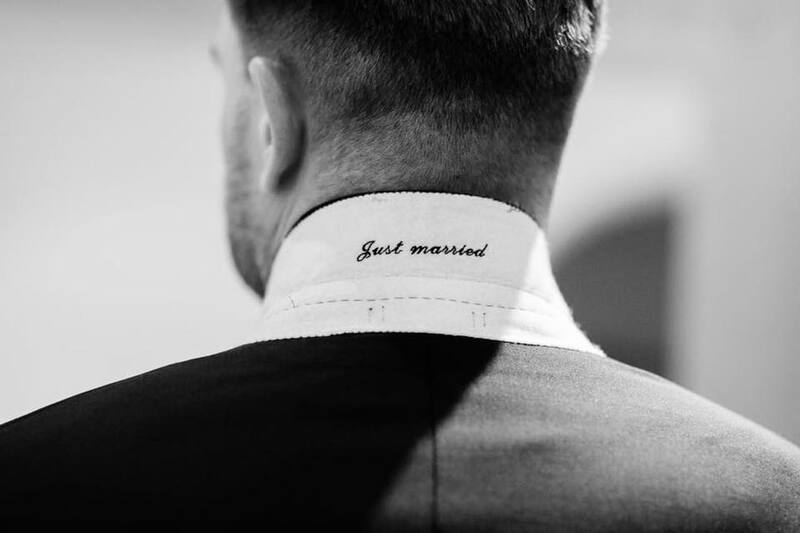 A simple touch such as the date of the wedding, or the bride and groom’s initials can add a personal feel to any shirt and make a unique made to measure shirt that truly is one of a kind. 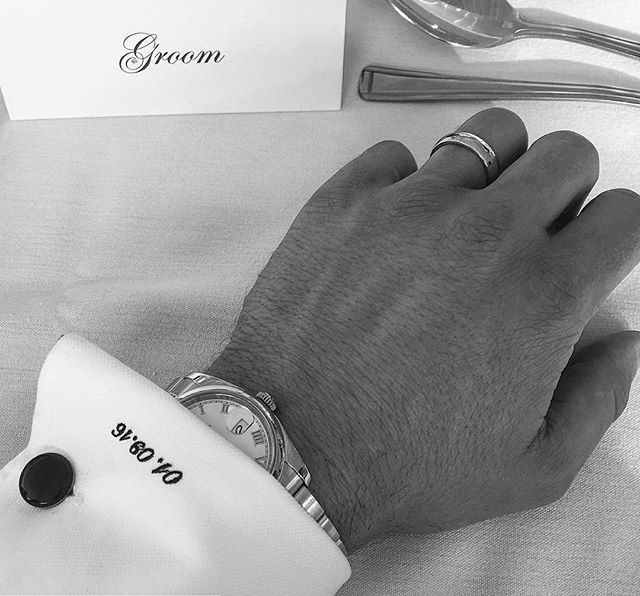 A personal touch with the wedding date on the cuff of the shirt worn by the groom on his wedding day. 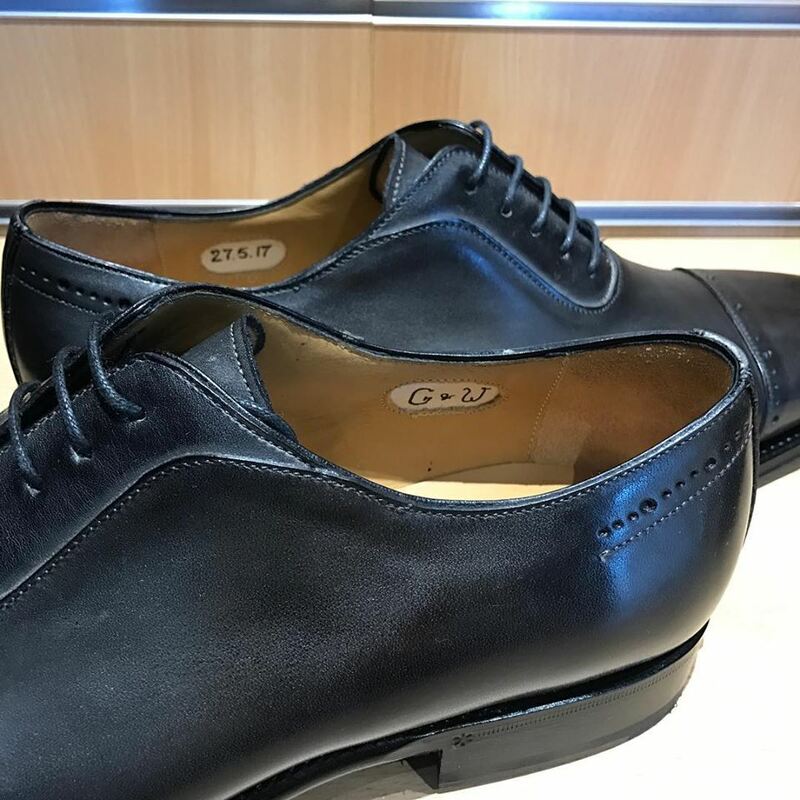 Well….. you’ve had the embroidery put on your made to measure shirt and suit, so you might as well put it into your bespoke shoes. Now this won’t be seen by anyone on your wedding day, or at all actually, but as the option is available to you at no extra charge it would be rude not to have your wedding date and initials put in. Now we don’t offer a range of fonts or colours with this embroidery, but does it really matter? No is the answer. But it does make for a good photo before you put them on. Design your own shoes with a personal monogram inside, for your benefit only. So yes it may seem a bit unnecessary at times, but guys need as much help as possible when it comes to remembering anniversary’s. That’s why we give them the chance to remember this special day, whether it be in a years time or in ten years time. And of course the embroidery can produce some truly incredible photo opportunities on your wedding day, so why not put it in. Be unique. Look different. Go bold! What should be worn to a Black Tie event? or a ‘White Tie’ event? When should we book our wedding suits? Previous PostThe ultimate made to measure wedding suit. © 2019 Anthony Formal Wear.